Insulin (from Latin insula, island) is a peptide hormone produced by beta cells of the pancreatic islets; it is considered to be the main anabolic hormone of the body. It regulates the metabolism of carbohydrates, fats and protein by promoting the absorption of carbohydrates, especially glucose from the blood into liver, fat and skeletal muscle cells. In these tissues the absorbed glucose is converted into either glycogen via glycogenesis or fats (triglycerides) via lipogenesis, or, in the case of the liver, into both. Glucose production and secretion by the liver is strongly inhibited by high concentrations of insulin in the blood. Circulating insulin also affects the synthesis of proteins in a wide variety of tissues. It is therefore an anabolic hormone, promoting the conversion of small molecules in the blood into large molecules inside the cells. Low insulin levels in the blood have the opposite effect by promoting widespread catabolism, especially of reserve body fat. Beta cells are sensitive to glucose concentrations, also known as blood sugar levels. When the glucose level is high, the beta cells secrete insulin into the blood; when glucose levels are low, secretion of insulin is inhibited. Their neighboring alpha cells, by taking their cues from the beta cells, secrete glucagon into the blood in the opposite manner: increased secretion when blood glucose is low, and decreased secretion when glucose concentrations are high. Glucagon, through stimulating the liver to release glucose by glycogenolysis and gluconeogenesis, has the opposite effect of insulin. The secretion of insulin and glucagon into the blood in response to the blood glucose concentration is the primary mechanism of glucose homeostasis. If beta cells are destroyed by an autoimmune reaction, insulin can no longer be synthesized or be secreted into the blood. This results in type 1 diabetes mellitus, which is characterized by abnormally high blood glucose concentrations, and generalized body wasting. In type 2 diabetes mellitus the destruction of beta cells is less pronounced than in type 1 diabetes, and is not due to an autoimmune process. Instead there is an accumulation of amyloid in the pancreatic islets, which likely disrupts their anatomy and physiology. The pathogenesis of type 2 diabetes is not well understood but patients exhibit a reduced population of islet beta-cells, reduced secretory function of islet beta-cells that survive, and peripheral tissue insulin resistance. Type 2 diabetes is characterized by high rates of glucagon secretion into the blood which are unaffected by, and unresponsive to the concentration of glucose in the blood. Insulin is still secreted into the blood in response to the blood glucose. As a result, the insulin levels, even when the blood sugar level is normal, are much higher than they are in healthy persons. The human insulin protein is composed of 51 amino acids, and has a molecular mass of 5808 Da. It is a dimer of an A-chain and a B-chain, which are linked together by disulfide bonds. Insulin's structure varies slightly between species of animals. Insulin from animal sources differs somewhat in effectiveness (in carbohydrate metabolism effects) from human insulin because of these variations. Porcine insulin is especially close to the human version, and was widely used to treat type 1 diabetics before human insulin could be produced in large quantities by recombinant DNA technologies. The crystal structure of insulin in the solid state was determined by Dorothy Hodgkin. It is on the WHO Model List of Essential Medicines, the most important medications needed in a basic health system. Insulin may have originated more than a billion years ago. The molecular origins of insulin go at least as far back as the simplest unicellular eukaryotes. Apart from animals, insulin-like proteins are also known to exist in the Fungi and Protista kingdoms. Insulin is produced by beta cells of the pancreatic islets in most vertebrates and by the Brockmann body in some teleost fish. Cone snails Conus geographus and Conus tulipa, venomous sea snails that hunt small fish, use modified forms of insulin in their venom cocktails. The insulin toxin, closer in structure to fishes' than to snails' native insulin, slows down the prey fishes by lowering their blood glucose levels. The preproinsulin precursor of insulin is encoded by the INS gene. A variety of mutant alleles with changes in the coding region have been identified. 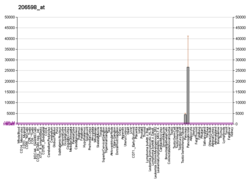 A read-through gene, INS-IGF2, overlaps with this gene at the 5' region and with the IGF2 gene at the 3' region. PDX1 (Pancreatic and duodenal homeobox protein 1) is in the nuclear periphery upon low blood glucose levels interacting with corepressors HDAC1 and 2 which is downregulating the insulin secretion. An increase in blood glucose levels causes phosphorylation of PDX1 and it translocates centrally and binds the A3 element within the insulin promoter. Upon translocation it interacts with coactivators HAT p300 and acetyltransferase set 7/9. PDX1 affects the histone modifications through acetylation and deacetylation as well as methylation. It is also said to suppress glucagon. NeuroD1, also known as β2, regulates insulin exocytosis in pancreatic β cells by directly inducing the expression of genes involved in exocytosis. It is localized in the cytosol, but in response to high glucose it becomes glycosylated by OGT and/or phosphorylated by ERK, which causes translocation to the nucleus. In the nucleus β2 heterodimerizes with E47, binds to the E1 element of the insulin promoter and recruits co-activator p300 which acetylates β2. It is able to interact with other transcription factors as well in activation of the insulin gene. MafA is degraded by proteasomes upon low blood glucose levels. Increased levels of glucose make an unknown protein glycosylated. This protein works as a transcription factor for MafA in an unknown manner and MafA is transported out of the cell. MafA is then translocated back into the nucleus where it binds the C1 element of the insulin promoter. These transcription factors work synergistically and in a complex arrangement. Increased blood glucose can after a while destroy the binding capacities of these proteins, and therefore reduce the amount of insulin secreted, causing diabetes. The decreased binding activities can be mediated by glucose induced oxidative stress and antioxidants are said to prevent the decreased insulin secretion in glucotoxic pancreatic β cells. Stress signalling molecules and reactive oxygen species inhibits the insulin gene by interfering with the cofactors binding the transcription factors and the transcription factors it self. Regulatory sequences and their transcription factors for the insulin gene. Within vertebrates, the amino acid sequence of insulin is strongly conserved. The molecular formula of human insulin is C257H383N65O77S6. Bovine insulin differs from human in only three amino acid residues, and porcine insulin in one. Even insulin from some species of fish is similar enough to human to be clinically effective in humans. Insulin in some invertebrates is quite similar in sequence to human insulin, and has similar physiological effects. The strong homology seen in the insulin sequence of diverse species suggests that it has been conserved across much of animal evolutionary history. The C-peptide of proinsulin (discussed later), however, differs much more among species; it is also a hormone, but a secondary one. The primary structure of bovine insulin was first determined by Frederick Sanger in 1951. After that, this polypeptide was synthesized independently by several groups. 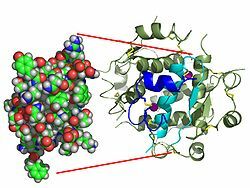 The 3-dimensional structure of insulin was determined by X-ray crystallography in Dorothy Hodgkin's laboratory in 1969 (PDB file 1ins). Insulin is produced and stored in the body as a hexamer (a unit of six insulin molecules), while the active form is the monomer. The hexamer is an inactive form with long-term stability, which serves as a way to keep the highly reactive insulin protected, yet readily available. The hexamer-monomer conversion is one of the central aspects of insulin formulations for injection. The hexamer is far more stable than the monomer, which is desirable for practical reasons; however, the monomer is a much faster-reacting drug because diffusion rate is inversely related to particle size. A fast-reacting drug means insulin injections do not have to precede mealtimes by hours, which in turn gives people with diabetes more flexibility in their daily schedules. Insulin can aggregate and form fibrillar interdigitated beta-sheets. This can cause injection amyloidosis, and prevents the storage of insulin for long periods. Insulin is produced in the pancreas and the Brockmann body (in some fish), and released when any of several stimuli are detected. These stimuli include the rise in plasma concentrations of amino acids and glucose resulting from the digestion of food. Carbohydrates can be polymers of simple sugars or the simple sugars themselves. If the carbohydrates include glucose, then that glucose will be absorbed into the bloodstream and blood glucose level will begin to rise. In target cells, insulin initiates a signal transduction, which has the effect of increasing glucose uptake and storage. Finally, insulin is degraded, terminating the response. Insulin consists of two polypeptide chains, the A- and B- chains, linked together by disulfide bonds. It is however first synthesized as a single polypeptide called preproinsulin in beta cells. Preproinsulin contains a 24-residue signal peptide which directs the nascent polypeptide chain to the rough endoplasmic reticulum (RER). The signal peptide is cleaved as the polypeptide is translocated into lumen of the RER, forming proinsulin. In the RER the proinsulin folds into the correct conformation and 3 disulfide bonds are formed. About 5–10 min after its assembly in the endoplasmic reticulum, proinsulin is transported to the trans-Golgi network (TGN) where immature granules are formed. Transport to the TGN may take about 30 min. 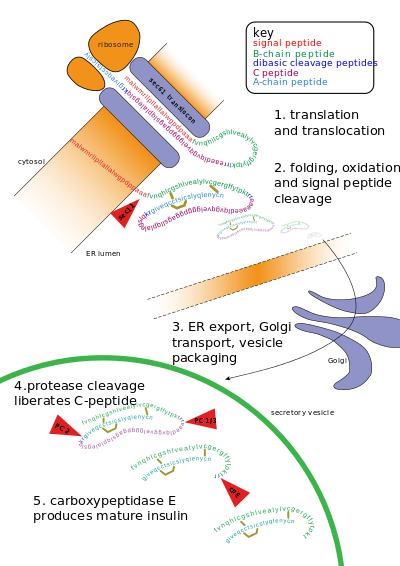 Proinsulin undergoes maturation into active insulin through the action of cellular endopeptidases known as prohormone convertases (PC1 and PC2), as well as the exoprotease carboxypeptidase E. The endopeptidases cleave at 2 positions, releasing a fragment called the C-peptide, and leaving 2 peptide chains, the B- and A- chains, linked by 2 disulfide bonds. The cleavage sites are each located after a pair of basic residues (lysine-64 and arginine-65, and arginine-31 and −32). After cleavage of the C-peptide, these 2 pairs of basic residues are removed by the carboxypeptidase. The C-peptide is the central portion of proinsulin, and the primary sequence of proinsulin goes in the order "B-C-A" (the B and A chains were identified on the basis of mass and the C-peptide was discovered later). The resulting mature insulin is packaged inside mature granules waiting for metabolic signals (such as leucine, arginine, glucose and mannose) and vagal nerve stimulation to be exocytosed from the cell into the circulation. Insulin and its related proteins have been shown to be produced inside the brain, and reduced levels of these proteins are linked to Alzheimer's disease. Insulin release is stimulated also by beta-2 receptor stimulation and inhibited by alpha-1 receptor stimulation. In addition, cortisol, glucagon and growth hormone antagonize the actions of insulin during times of stress. Insulin also inhibits fatty acid release by hormone sensitive lipase in adipose tissue. Beta cells in the islets of Langerhans release insulin in two phases. The first-phase release is rapidly triggered in response to increased blood glucose levels, and lasts about 10 minutes. The second phase is a sustained, slow release of newly formed vesicles triggered independently of sugar, peaking in 2 to 3 hours. Reduced first-phase insulin release may be the earliest detectable beta cell defect predicting onset of type 2 diabetes. First-phase release and insulin sensitivity are independent predictors of diabetes. Glucose enters the β-cells through the glucose transporters, GLUT2. These glucose transporters have a relatively low affinity for glucose, ensuring that the rate of glucose entry into the β-cells is proportional to the extracellular glucose concentration (within the physiological range). At low blood sugar levels very little glucose enters the β-cells; at high blood glucose concentrations large quantities of glucose enter these cells. The glucose that enters the β-cell is phosphorylated to glucose-6-phosphate (G-6-P) by glucokinase (hexokinase IV) which is not inhibited by G-6-P in the way that the hexokinases in other tissues (hexokinase I – III) are affected by this product. This means that the intracellular G-6-P concentration remains proportional to the blood sugar concentration. Glucose-6-phosphate enters glycolytic pathway and then, via the pyruvate dehydrogenase reaction, into the Krebs cycle, where multiple, high-energy ATP molecules are produced by the oxidation of acetyl CoA (the Krebs cycle substrate), leading to a rise in the ATP:ADP ratio within the cell. The cytosolic calcium ion concentration can also be increased by calcium release from intracellular stores via activation of ryanodine receptors. The calcium ion concentration in the cytosol of the beta cells can also, or additionally, be increased through the activation of phospholipase C resulting from the binding of an extracellular ligand (hormone or neurotransmitter) to a G protein-coupled membrane receptor. Phospholipase C cleaves the membrane phospholipid, phosphatidyl inositol 4,5-bisphosphate, into inositol 1,4,5-trisphosphate and diacylglycerol. Inositol 1,4,5-trisphosphate (IP3) then binds to receptor proteins in the plasma membrane of the endoplasmic reticulum (ER). This allows the release of Ca2+ ions from the ER via IP3-gated channels, which raises the cytosolic concentration of calcium ions independently of the effects of a high blood glucose concentration. Parasympathetic stimulation of the pancreatic islets operates via this pathway to increase insulin secretion into the blood. This is the primary mechanism for release of insulin. Other substances known to stimulate insulin release include the amino acids arginine and leucine, parasympathetic release of acetylcholine (acting via the phospholipase C pathway), sulfonylurea, cholecystokinin (CCK, also via phospholipase C), and the gastrointestinally derived incretins, such as glucagon-like peptide-1 (GLP-1) and glucose-dependent insulinotropic peptide (GIP). Release of insulin is strongly inhibited by norepinephrine (noradrenaline), which leads to increased blood glucose levels during stress. It appears that release of catecholamines by the sympathetic nervous system has conflicting influences on insulin release by beta cells, because insulin release is inhibited by α2-adrenergic receptors and stimulated by β2-adrenergic receptors. The net effect of norepinephrine from sympathetic nerves and epinephrine from adrenal glands on insulin release is inhibition due to dominance of the α-adrenergic receptors. Even during digestion, in general, one or two hours following a meal, insulin release from the pancreas is not continuous, but oscillates with a period of 3–6 minutes, changing from generating a blood insulin concentration more than about 800 p mol/l to less than 100 pmol/l. This is thought to avoid downregulation of insulin receptors in target cells, and to assist the liver in extracting insulin from the blood. This oscillation is important to consider when administering insulin-stimulating medication, since it is the oscillating blood concentration of insulin release, which should, ideally, be achieved, not a constant high concentration. This may be achieved by delivering insulin rhythmically to the portal vein or by islet cell transplantation to the liver. The blood insulin level can be measured in international units, such as µIU/mL or in molar concentration, such as pmol/L, where 1 µIU/mL equals 6.945 pmol/L. A typical blood level between meals is 8–11 μIU/mL (57–79 pmol/L). The effects of insulin are initiated by its binding to a receptor present in the cell membrane. The receptor molecule contains an α- and β subunits. Two molecules are joined to form what is known as a homodimer. Insulin binds to the α-subunits of the homodimer, which faces the extracellular side of the cells. The β subunits have tyrosine kinase enzyme activity which is triggered by the insulin binding. This activity provokes the autophosphorylation of the β subunits and subsequently the phosphorylation of proteins inside the cell known as insulin receptor substrates (IRS). The phosphorylation of the IRS activates a signal transduction cascade that leads to the activation of other kinases as well as transcription factors that mediate the intracellular effects of insulin. The cascade that leads to the insertion of GLUT4 glucose transporters into the cell membranes of muscle and fat cells, and to the synthesis of glycogen in liver and muscle tissue, as well as the conversion of glucose into triglycerides in liver, adipose, and lactating mammary gland tissue, operates via the activation, by IRS-1, of phosphoinositol 3 kinase (PI3K). This enzyme converts a phospholipid in the cell membrane by the name of phosphatidylinositol 4,5-bisphosphate (PIP2), into phosphatidylinositol 3,4,5-triphosphate (PIP3), which, in turn, activates protein kinase B (PKB). Activated PKB facilitates the fusion of GLUT4 containing endosomes with the cell membrane, resulting in an increase in GLUT4 transporters in the plasma membrane. PKB also phosphorylates glycogen synthase kinase (GSK), thereby inactivating this enzyme. This means that its substrate, glycogen synthase (GS), cannot be phosphorylated, and remains dephosphorylated, and therefore active. The active enzyme, glycogen synthase (GS), catalyzes the rate limiting step in the synthesis of glycogen from glucose. Similar dephosphorylations affect the enzymes controlling the rate of glycolysis leading to the synthesis of fats via malonyl-CoA in the tissues that can generate triglycerides, and also the enzymes that control the rate of gluconeogenesis in the liver. The overall effect of these final enzyme dephosphorylations is that, in the tissues that can carry out these reactions, glycogen and fat synthesis from glucose are stimulated, and glucose production by the liver through glycogenolysis and gluconeogenesis are inhibited. The breakdown of triglycerides by adipose tissue into free fatty acids and glycerol is also inhibited. After the intracellular signal that resulted from the binding of insulin to its receptor has been produced, termination of signaling is then needed. As mentioned below in the section on degradation, endocytosis and degradation of the receptor bound to insulin is a main mechanism to end signaling. In addition, the signaling pathway is also terminated by dephosphorylation of the tyrosine residues in the various signaling pathways by tyrosine phosphatases. Serine/Threonine kinases are also known to reduce the activity of insulin. The structure of the insulin–insulin receptor complex has been determined using the techniques of X-ray crystallography. Stimulates the uptake of glucose – Insulin decreases blood glucose concentration by inducing intake of glucose by the cells. This is possible because Insulin causes the insertion of the GLUT4 transporter in the cell membranes of muscle and fat tissues which allows glucose to enter the cell. Increased fat synthesis – insulin forces fat cells to take in blood glucose, which is converted into triglycerides; decrease of insulin causes the reverse. Increased esterification of fatty acids – forces adipose tissue to make neutral fats (i.e., triglycerides) from fatty acids; decrease of insulin causes the reverse. Decreased lipolysis – forces reduction in conversion of fat cell lipid stores into blood fatty acids and glycerol; decrease of insulin causes the reverse. Induce glycogen synthesis – When glucose levels are high, insulin induces the formation of glycogen by the activation of the hexokinase enzyme, which adds a phosphate group in glucose, thus resulting in a molecule that cannot exit the cell. At the same time, insulin inhibits the enzyme glucose-6-phosphatase, which removes the phosphate group. These two enzymes are key for the formation of glycogen. Also, insulin activates the enzymes phosphofructokinase and glycogen synthase which are responsible for glycogen synthesis. Decreased gluconeogenesis and glycogenolysis – decreases production of glucose from noncarbohydrate substrates, primarily in the liver (the vast majority of endogenous insulin arriving at the liver never leaves the liver); increase of insulin causes glucose production by the liver from assorted substrates. Decreased autophagy – decreased level of degradation of damaged organelles. Postprandial levels inhibit autophagy completely. Increased amino acid uptake – forces cells to absorb circulating amino acids; decrease of insulin inhibits absorption. Arterial muscle tone – forces arterial wall muscle to relax, increasing blood flow, especially in microarteries; decrease of insulin reduces flow by allowing these muscles to contract. Increased potassium uptake – forces cells synthesizing glycogen (a very spongy, "wet" substance, that increases the content of intracellular water, and its accompanying K+ ions) to absorb potassium from the extracellular fluids; lack of insulin inhibits absorption. Insulin's increase in cellular potassium uptake lowers potassium levels in blood plasma. This possibly occurs via insulin-induced translocation of the Na+/K+-ATPase to the surface of skeletal muscle cells. Insulin also influences other body functions, such as vascular compliance and cognition. Once insulin enters the human brain, it enhances learning and memory and benefits verbal memory in particular. Enhancing brain insulin signaling by means of intranasal insulin administration also enhances the acute thermoregulatory and glucoregulatory response to food intake, suggesting that central nervous insulin contributes to the co-ordination of a wide variety of homeostatic or regulatory processes in the human body. Insulin also has stimulatory effects on gonadotropin-releasing hormone from the hypothalamus, thus favoring fertility. Once an insulin molecule has docked onto the receptor and effected its action, it may be released back into the extracellular environment, or it may be degraded by the cell. The two primary sites for insulin clearance are the liver and the kidney. The liver clears most insulin during first-pass transit, whereas the kidney clears most of the insulin in systemic circulation. Degradation normally involves endocytosis of the insulin-receptor complex, followed by the action of insulin-degrading enzyme. An insulin molecule produced endogenously by the beta cells is estimated to be degraded within about one hour after its initial release into circulation (insulin half-life ~ 4–6 minutes). Insulin is a major regulator of endocannabinoid (EC) metabolism and insulin treatment has been shown to reduce intracellular ECs, the 2-arachidonylglycerol (2-AG) and anandamide (AEA), which correspond with insulin-sensitive expression changes in enzymes of EC metabolism. In insulin-resistant adipocytes, patterns of insulin-induced enzyme expression is disturbed in a manner consistent with elevated EC synthesis and reduced EC degradation. Findings suggest that insulin-resistant adipocytes fail to regulate EC metabolism and decrease intracellular EC levels in response to insulin stimulation, whereby obese insulin-resistant individuals exhibit increased concentrations of ECs. This dysregulation contributes to excessive visceral fat accumulation and reduced adiponectin release from abdominal adipose tissue, and further to the onset of several cardiometabolic risk factors that are associated with obesity and type 2 diabetes. Hypoglycemia, also known as "low blood sugar", is when blood sugar decreases to below normal levels. This may result in a variety of symptoms including clumsiness, trouble talking, confusion, loss of consciousness, seizures or death. A feeling of hunger, sweating, shakiness and weakness may also be present. Symptoms typically come on quickly. The most common cause of hypoglycemia is medications used to treat diabetes mellitus such as insulin and sulfonylureas. Risk is greater in diabetics who have eaten less than usual, exercised more than usual or have drunk alcohol. Other causes of hypoglycemia include kidney failure, certain tumors, such as insulinoma, liver disease, hypothyroidism, starvation, inborn error of metabolism, severe infections, reactive hypoglycemia and a number of drugs including alcohol. Low blood sugar may occur in otherwise healthy babies who have not eaten for a few hours. Biosynthetic human insulin (insulin human rDNA, INN) for clinical use is manufactured by recombinant DNA technology. Biosynthetic human insulin has increased purity when compared with extractive animal insulin, enhanced purity reducing antibody formation. Researchers have succeeded in introducing the gene for human insulin into plants as another method of producing insulin ("biopharming") in safflower. This technique is anticipated to reduce production costs. Several analogs of human insulin are available. These insulin analogs are closely related to the human insulin structure, and were developed for specific aspects of glycemic control in terms of fast action (prandial insulins) and long action (basal insulins). The first biosynthetic insulin analog was developed for clinical use at mealtime (prandial insulin), Humalog (insulin lispro), it is more rapidly absorbed after subcutaneous injection than regular insulin, with an effect 15 minutes after injection. Other rapid-acting analogues are NovoRapid and Apidra, with similar profiles. All are rapidly absorbed due to amino acid sequences that will reduce formation of dimers and hexamers (monomeric insulins are more rapidly absorbed). Fast acting insulins do not require the injection-to-meal interval previously recommended for human insulin and animal insulins. The other type is long acting insulin; the first of these was Lantus (insulin glargine). These have a steady effect for an extended period from 18 to 24 hours. Likewise, another protracted insulin analogue (Levemir) is based on a fatty acid acylation approach. A myristic acid molecule is attached to this analogue, which associates the insulin molecule to the abundant serum albumin, which in turn extends the effect and reduces the risk of hypoglycemia. Both protracted analogues need to be taken only once daily, and are used for type 1 diabetics as the basal insulin. A combination of a rapid acting and a protracted insulin is also available, making it more likely for patients to achieve an insulin profile that mimics that of the body´s own insulin release. Synthetic insulin can trigger adverse effects, so some people with diabetes rely on animal-source insulin. Unlike many medicines, insulin currently cannot be taken orally because, like nearly all other proteins introduced into the gastrointestinal tract, it is reduced to fragments, whereupon all activity is lost. There has been some research into ways to protect insulin from the digestive tract, so that it can be administered orally or sublingually. In 1869, while studying the structure of the pancreas under a microscope, Paul Langerhans, a medical student in Berlin, identified some previously unnoticed tissue clumps scattered throughout the bulk of the pancreas. The function of the "little heaps of cells", later known as the islets of Langerhans, initially remained unknown, but Édouard Laguesse later suggested they might produce secretions that play a regulatory role in digestion. Paul Langerhans' son, Archibald, also helped to understand this regulatory role. The term "insulin" originates from insula, the Latin word for islet/island. In 1889, the physician Oskar Minkowski, in collaboration with Joseph von Mering, removed the pancreas from a healthy dog to test its assumed role in digestion. On testing the urine, they found sugar, establishing for the first time a relationship between the pancreas and diabetes. In 1901, another major step was taken by the American physician and scientist Eugene Lindsay Opie, when he isolated the role of the pancreas to the islets of Langerhans: "Diabetes mellitus when the result of a lesion of the pancreas is caused by destruction of the islands of Langerhans and occurs only when these bodies are in part or wholly destroyed". Over the next two decades researchers made several attempts to isolate the islets' secretions. In 1906 George Ludwig Zuelzer achieved partial success in treating dogs with pancreatic extract, but he was unable to continue his work. Between 1911 and 1912, E.L. Scott at the University of Chicago tried aqueous pancreatic extracts and noted "a slight diminution of glycosuria", but was unable to convince his director of his work's value; it was shut down. Israel Kleiner demonstrated similar effects at Rockefeller University in 1915, but World War I interrupted his work and he did not return to it. In 1916, Nicolae Paulescu developed an aqueous pancreatic extract which, when injected into a diabetic dog, had a normalizing effect on blood-sugar levels. He had to interrupt his experiments because of World War I, and in 1921 he wrote four papers about his work carried out in Bucharest and his tests on a diabetic dog. Later that year, he published "Research on the Role of the Pancreas in Food Assimilation". In October 1920, Canadian Frederick Banting concluded that the digestive secretions that Minkowski had originally studied were breaking down the islet secretion, thereby making it impossible to extract successfully. A surgeon by training, Banting knew certain arteries could be tied off that would lead most of the pancreas to atrophy, while leaving the islets of Langerhans intact. He reasoned that a relatively pure extract could be made from the islets once most of the rest of the pancreas was gone. He jotted a note to himself: "Ligate pancreatic ducts of the dog. Keep dogs alive till acini degenerate leaving islets. Try to isolate internal secretion of these and relieve glycosuria." In the spring of 1921, Banting traveled to Toronto to explain his idea to J.J.R. Macleod, Professor of Physiology at the University of Toronto. Macleod was initially skeptical, since Banting had no background in research and was not familiar with the latest literature, but he agreed to provide lab space for Banting to test out his ideas. Macleod also arranged for two undergraduates to be Banting's lab assistants that summer, but Banting required only one lab assistant. Charles Best and Clark Noble flipped a coin; Best won the coin toss and took the first shift. This proved unfortunate for Noble, as Banting kept Best for the entire summer and eventually shared half his Nobel Prize money and credit for the discovery with Best. On 30 July 1921, Banting and Best successfully isolated an extract ("isleton") from the islets of a duct-tied dog and injected it into a diabetic dog, finding that the extract reduced its blood sugar by 40% in 1 hour. Banting and Best presented their results to Macleod on his return to Toronto in the fall of 1921, but Macleod pointed out flaws with the experimental design, and suggested the experiments be repeated with more dogs and better equipment. He moved Banting and Best into a better laboratory and began paying Banting a salary from his research grants. Several weeks later, the second round of experiments was also a success, and Macleod helped publish their results privately in Toronto that November. Bottlenecked by the time-consuming task of duct-tying dogs and waiting several weeks to extract insulin, Banting hit upon the idea of extracting insulin from the fetal calf pancreas, which had not yet developed digestive glands. By December, they had also succeeded in extracting insulin from the adult cow pancreas. Macleod discontinued all other research in his laboratory to concentrate on the purification of insulin. He invited biochemist James Collip to help with this task, and the team felt ready for a clinical test within a month. On January 11, 1922, Leonard Thompson, a 14-year-old diabetic who lay dying at the Toronto General Hospital, was given the first injection of insulin. However, the extract was so impure that Thompson suffered a severe allergic reaction, and further injections were cancelled. Over the next 12 days, Collip worked day and night to improve the ox-pancreas extract. A second dose was injected on January 23, completely eliminating the glycosuria that was typical of diabetes without causing any obvious side-effects. The first American patient was Elizabeth Hughes, the daughter of U.S. Secretary of State Charles Evans Hughes. The first patient treated in the U.S. was future woodcut artist James D. Havens; Dr. John Ralston Williams imported insulin from Toronto to Rochester, New York, to treat Havens. Purified animal-sourced insulin was initially the only type of insulin available to diabetics. The amino acid structure of insulin was characterized in the early 1950s by Frederick Sanger, and the first synthetic insulin was produced simultaneously in the labs of Panayotis Katsoyannis at the University of Pittsburgh and Helmut Zahn at RWTH Aachen University in the early 1960s. Synthetic crystalline bovine insulin was achieved by Chinese researchers in 1965. The first genetically engineered, synthetic "human" insulin was produced using E. coli in 1978 by Arthur Riggs and Keiichi Itakura at the Beckman Research Institute of the City of Hope in collaboration with Herbert Boyer at Genentech. Genentech, founded by Swanson, Boyer and Eli Lilly and Company, went on in 1982 to sell the first commercially available biosynthetic human insulin under the brand name Humulin. The vast majority of insulin currently used worldwide is now biosynthetic recombinant "human" insulin or its analogues. Recombinant insulin is produced either in yeast (usually Saccharomyces cerevisiae) or E. coli. In yeast, insulin may be engineered as a single-chain protein with a KexII endoprotease (a yeast homolog of PCI/PCII) site that separates the insulin A chain from a c-terminally truncated insulin B chain. A chemically synthesized c-terminal tail is then grafted onto insulin by reverse proteolysis using the inexpensive protease trypsin; typically the lysine on the c-terminal tail is protected with a chemical protecting group to prevent proteolysis. The ease of modular synthesis and the relative safety of modifications in that region accounts for common insulin analogs with c-terminal modifications (e.g. lispro, aspart, glulisine). The Genentech synthesis and completely chemical synthesis such as that by Bruce Merrifield are not preferred because the efficiency of recombining the two insulin chains is low, primarily due to competition with the precipitation of insulin B chain. The Nobel Prize committee in 1923 credited the practical extraction of insulin to a team at the University of Toronto and awarded the Nobel Prize to two men: Frederick Banting and J.J.R. Macleod. They were awarded the Nobel Prize in Physiology or Medicine in 1923 for the discovery of insulin. Banting, incensed that Best was not mentioned, shared his prize with him, and Macleod immediately shared his with James Collip. The patent for insulin was sold to the University of Toronto for one dollar. Two other Nobel Prizes have been awarded for work on insulin. British molecular biologist Frederick Sanger determined the primary structure of insulin in 1955, making it the first protein to be sequenced. Sanger was awarded the 1958 Nobel Prize in Chemistry for this work. Rosalyn Sussman Yalow received the 1977 Nobel Prize in Medicine for the development of the radioimmunoassay for insulin. Several Nobel Prizes also have an indirect connection with insulin. George Minot, co-recipient of the 1934 Nobel Prize for the development of the first effective treatment for pernicious anemia, had diabetes mellitus. Dr. William Castle observed that the 1921 discovery of insulin, arriving in time to keep Minot alive, was therefore also responsible for the discovery of a cure for pernicious anemia. Dorothy Hodgkin was awarded a Nobel Prize in Chemistry in 1964 for the development of crystallography. In 1969, after decades of work, Hodgkin determined the spatial conformation of insulin, the so-called tertiary structure, by means of X-ray diffraction studies. Insufficient recognition has been given to Paulescu, the distinguished Romanian scientist, who at the time when the Toronto team were commencing their research had already succeeded in extracting the antidiabetic hormone of the pancreas and proving its efficacy in reducing the hyperglycaemia in diabetic dogs. In a private communication, Professor Arne Tiselius, former head of the Nobel Institute, expressed his personal opinion that Paulescu was equally worthy of the award in 1923. ^ a b Voet D, Voet JG (2011). Biochemistry (4th ed.). New York: Wiley. ^ a b c d e Stryer L (1995). Biochemistry (Fourth ed.). New York: W.H. Freeman and Company. pp. 773–74. ISBN 0 7167 2009 4. ^ Sonksen P, Sonksen J (July 2000). "Insulin: understanding its action in health and disease". British Journal of Anaesthesia. 85 (1): 69–79. doi:10.1093/bja/85.1.69. PMID 10927996. ^ a b c d e f g h Koeslag JH, Saunders PT, Terblanche E (June 2003). "A reappraisal of the blood glucose homeostat which comprehensively explains the type 2 diabetes mellitus-syndrome X complex". The Journal of Physiology (published 2003). 549 (Pt 2): 333–46. doi:10.1113/jphysiol.2002.037895. PMC 2342944. PMID 12717005. ^ American Society of Health-System Pharmacists (2009-02-01). "Insulin Injection". PubMed Health. National Center for Biotechnology Information, U.S. National Library of Medicine. Retrieved 2012-10-12. ^ a b "First Successful Laboratory Production of Human Insulin Announced". News Release. Genentech. 1978-09-06. Retrieved 2016-09-26. ^ a b c Tof I (1994). "Recombinant DNA technology in the synthesis of human insulin". Little Tree Publishing. Retrieved 2009-11-03. ^ a b Aggarwal SR (December 2012). "What's fueling the biotech engine-2011 to 2012". Nature Biotechnology. 30 (12): 1191–97. doi:10.1038/nbt.2437. PMID 23222785. ^ a b de Souza AM, López JA (2004). "Insulin or insulin-like studies on unicellular organisms: a review". Braz. Arch. Biol. Technol. 47 (6): 973–81. doi:10.1590/S1516-89132004000600017. ^ LeRoith D, Shiloach J, Heffron R, Rubinovitz C, Tanenbaum R, Roth J (August 1985). "Insulin-related material in microbes: similarities and differences from mammalian insulins". Canadian Journal of Biochemistry and Cell Biology. 63 (8): 839–49. doi:10.1139/o85-106. PMID 3933801. ^ Wright JR, Yang H, Hyrtsenko O, Xu BY, Yu W, Pohajdak B (2014). "A review of piscine islet xenotransplantation using wild-type tilapia donors and the production of transgenic tilapia expressing a "humanized" tilapia insulin". Xenotransplantation. 21 (6): 485–95. doi:10.1111/xen.12115. PMC 4283710. PMID 25040337. ^ "Deadly sea snail uses weaponised insulin to make its prey sluggish". The Guardian. 19 January 2015. ^ Safavi-Hemami H, Gajewiak J, Karanth S, Robinson SD, Ueberheide B, Douglass AD, Schlegel A, Imperial JS, Watkins M, Bandyopadhyay PK, Yandell M, Li Q, Purcell AW, Norton RS, Ellgaard L, Olivera BM (February 2015). "Specialized insulin is used for chemical warfare by fish-hunting cone snails". Proceedings of the National Academy of Sciences of the United States of America. 112 (6): 1743–48. Bibcode:2015PNAS..112.1743S. doi:10.1073/pnas.1423857112. PMC 4330763. PMID 25605914. ^ a b "Entrez Gene: INS insulin". ^ Bell GI, Pictet RL, Rutter WJ, Cordell B, Tischer E, Goodman HM (March 1980). "Sequence of the human insulin gene". Nature. 284 (5751): 26–32. Bibcode:1980Natur.284...26B. doi:10.1038/284026a0. PMID 6243748. ^ Bernardo AS, Hay CW, Docherty K (November 2008). "Pancreatic transcription factors and their role in the birth, life and survival of the pancreatic beta cell". review. Molecular and Cellular Endocrinology. 294 (1–2): 1–9. doi:10.1016/j.mce.2008.07.006. PMID 18687378. ^ Rutter GA, Pullen TJ, Hodson DJ, Martinez-Sanchez A (March 2015). "Pancreatic β-cell identity, glucose sensing and the control of insulin secretion". review. The Biochemical Journal. 466 (2): 203–18. doi:10.1042/BJ20141384. PMID 25697093. ^ Rutter GA, Tavaré JM, Palmer DG (June 2000). "Regulation of Mammalian Gene Expression by Glucose". review. News in Physiological Sciences. 15 (3): 149–54. doi:10.1152/physiologyonline.2000.15.3.149. PMID 11390898. ^ Poitout V, Hagman D, Stein R, Artner I, Robertson RP, Harmon JS (April 2006). "Regulation of the insulin gene by glucose and d acids". review. The Journal of Nutrition. 136 (4): 873–76. doi:10.1093/jn/136.4.873. PMC 1853259. PMID 16549443. ^ Vaulont S, Vasseur-Cognet M, Kahn A (October 2000). "Glucose regulation of gene transcription". review. The Journal of Biological Chemistry. 275 (41): 31555–58. doi:10.1074/jbc.R000016200. PMID 10934218. ^ Christensen DP, Dahllöf M, Lundh M, Rasmussen DN, Nielsen MD, Billestrup N, Grunnet LG, Mandrup-Poulsen T (2011). "Histone deacetylase (HDAC) inhibition as a novel treatment for diabetes mellitus". Molecular Medicine (Cambridge, Mass.). 17 (5–6): 378–90. doi:10.2119/molmed.2011.00021. PMC 3105132. PMID 21274504. ^ Wang W, Shi Q, Guo T, Yang Z, Jia Z, Chen P, Zhou C (June 2016). "PDX1 and ISL1 differentially coordinate with epigenetic modifications to regulate insulin gene expression in varied glucose concentrations". Molecular and Cellular Endocrinology. 428: 38–48. doi:10.1016/j.mce.2016.03.019. PMID 26994512. ^ Wang X, Wei X, Pang Q, Yi F (August 2012). "Histone deacetylases and their inhibitors: molecular mechanisms and therapeutic implications in diabetes mellitus". Acta Pharmaceutica Sinica B. 2 (4): 387–95. doi:10.1016/j.apsb.2012.06.005. ^ a b Andrali SS, Sampley ML, Vanderford NL, Ozcan S (October 2008). "Glucose regulation of insulin gene expression in pancreatic beta-cells". review. The Biochemical Journal. 415 (1): 1–10. doi:10.1042/BJ20081029. PMID 18778246. ^ Kaneto H, Matsuoka TA, Kawashima S, Yamamoto K, Kato K, Miyatsuka T, Katakami N, Matsuhisa M (July 2009). "Role of MafA in pancreatic beta-cells". Advanced Drug Delivery Reviews. 61 (7–8): 489–96. doi:10.1016/j.addr.2008.12.015. PMID 19393272. ^ Aramata S, Han SI, Kataoka K (December 2007). "Roles and regulation of transcription factor MafA in islet beta-cells". Endocrine Journal. 54 (5): 659–66. doi:10.1507/endocrj.KR-101. PMID 17785922. ^ Kaneto H, Matsuoka TA (October 2012). "Involvement of oxidative stress in suppression of insulin biosynthesis under diabetic conditions". International Journal of Molecular Sciences. 13 (10): 13680–90. doi:10.3390/ijms131013680. PMC 3497347. PMID 23202973. ^ Melloul D, Marshak S, Cerasi E (March 2002). "Regulation of insulin gene transcription". Diabetologia. 45 (3): 309–26. doi:10.1007/s00125-001-0728-y. PMID 11914736. ^ Jang WG, Kim EJ, Park KG, Park YB, Choi HS, Kim HJ, Kim YD, Kim KS, Lee KU, Lee IK (January 2007). "Glucocorticoid receptor mediated repression of human insulin gene expression is regulated by PGC-1alpha". Biochemical and Biophysical Research Communications. 352 (3): 716–21. doi:10.1016/j.bbrc.2006.11.074. PMID 17150186. ^ "Insulin human". PubChem. Retrieved 26 February 2019. ^ Sanger F, Tuppy H (September 1951). "The amino-acid sequence in the phenylalanyl chain of insulin. I. The identification of lower peptides from partial hydrolysates". The Biochemical Journal. 49 (4): 463–81. doi:10.1042/bj0490463. PMC 1197535. PMID 14886310. ; Sanger F, Tuppy H (September 1951). "The amino-acid sequence in the phenylalanyl chain of insulin. 2. The investigation of peptides from enzymic hydrolysates". The Biochemical Journal. 49 (4): 481–90. doi:10.1042/bj0490481. PMC 1197536. PMID 14886311. ; Sanger F, Thompson EO (February 1953). "The amino-acid sequence in the glycyl chain of insulin. I. The identification of lower peptides from partial hydrolysates". The Biochemical Journal. 53 (3): 353–66. doi:10.1042/bj0530353. PMC 1198157. PMID 13032078. ; Sanger F, Thompson EO (February 1953). "The amino-acid sequence in the glycyl chain of insulin. II. The investigation of peptides from enzymic hydrolysates". The Biochemical Journal. 53 (3): 366–74. doi:10.1042/bj0530366. PMC 1198158. PMID 13032079. ^ Katsoyannis PG, Fukuda K, Tometsko A, Suzuki K, Tilak M (1964). "Insulin Peptides. X. The Synthesis of the B-Chain of Insulin and Its Combination with Natural or Synthetis A-Chin to Generate Insulin Activity". Journal of the American Chemical Society. 86 (5): 930–32. doi:10.1021/ja01059a043. ^ Kung YT, Du YC, Huang WT, Chen CC, Ke LT (November 1965). "Total synthesis of crystalline bovine insulin". Scientia Sinica. 14 (11): 1710–16. PMID 5881570. ^ Marglin A, Merrifield RB (November 1966). "The synthesis of bovine insulin by the solid phase method". Journal of the American Chemical Society. 88 (21): 5051–52. doi:10.1021/ja00973a068. PMID 5978833. ^ Blundell TL, Cutfield JF, Cutfield SM, Dodson EJ, Dodson GG, Hodgkin DC, Mercola DA, Vijayan M (June 1971). "Atomic positions in rhombohedral 2-zinc insulin crystals". Nature. 231 (5304): 506–11. Bibcode:1971Natur.231..506B. doi:10.1038/231506a0. PMID 4932997. ^ Dunn MF (August 2005). "Zinc-ligand interactions modulate assembly and stability of the insulin hexamer – a review". Biometals. 18 (4): 295–303. doi:10.1007/s10534-005-3685-y. PMID 16158220. ^ Ivanova MI, Sievers SA, Sawaya MR, Wall JS, Eisenberg D (November 2009). "Molecular basis for insulin fibril assembly". Proceedings of the National Academy of Sciences of the United States of America. 106 (45): 18990–95. Bibcode:2009PNAS..10618990I. doi:10.1073/pnas.0910080106. PMC 2776439. PMID 19864624. ^ Rhoades RA, Bell DR (2009). Medical physiology : principles for clinical medicine (3rd ed.). Philadelphia: Lippincott Williams & Wilkins. pp. 644–47. ISBN 978-0-7817-6852-8. ^ Kahn CR, Weir GC (2005). Joslin's Diabetes Mellitus (14th ed.). Lippincott Williams & Wilkins. ISBN 978-8493531836. ^ Steiner DF, Oyer PE (February 1967). "The biosynthesis of insulin and a probable precursor of insulin by a human islet cell adenoma". Proceedings of the National Academy of Sciences of the United States of America. 57 (2): 473–80. Bibcode:1967PNAS...57..473S. doi:10.1073/pnas.57.2.473. PMC 335530. PMID 16591494. ^ Creighton TE (1993). Proteins: Structures and Molecular Properties (2nd ed.). W H Freeman and Company. pp. 81–83. ISBN 978-0-7167-2317-2. ^ a b Najjar S (2001). "Insulin Action: Molecular Basis of Diabetes". Encyclopedia of Life Sciences. John Wiley & Sons. doi:10.1038/npg.els.0001402. ISBN 978-0470016176. ^ Gustin N (2005-03-07). "Researchers discover link between insulin and Alzheimer's". EurekAlert!. American Association for the Advancement of Science. Retrieved 2009-01-01. ^ de la Monte SM, Wands JR (February 2005). "Review of insulin and insulin-like growth factor expression, signaling, and malfunction in the central nervous system: relevance to Alzheimer's disease". Journal of Alzheimer's Disease. 7 (1): 45–61. doi:10.3233/JAD-2005-7106. PMID 15750214. ^ Steen E, Terry BM, Rivera EJ, Cannon JL, Neely TR, Tavares R, Xu XJ, Wands JR, de la Monte SM (February 2005). "Impaired insulin and insulin-like growth factor expression and signaling mechanisms in Alzheimer's disease—is this type 3 diabetes?". Journal of Alzheimer's Disease. 7 (1): 63–80. doi:10.3233/jad-2005-7107. PMID 15750215. ^ Gerich JE (February 2002). "Is reduced first-phase insulin release the earliest detectable abnormality in individuals destined to develop type 2 diabetes?". Diabetes. 51 (Suppl 1): S117–21. doi:10.2337/diabetes.51.2007.s117. PMID 11815469. ^ Lorenzo C, Wagenknecht LE, Rewers MJ, Karter AJ, Bergman RN, Hanley AJ, Haffner SM (September 2010). "Disposition index, glucose effectiveness, and conversion to type 2 diabetes: the Insulin Resistance Atherosclerosis Study (IRAS)". Diabetes Care. 33 (9): 2098–103. doi:10.2337/dc10-0165. PMC 2928371. PMID 20805282. ^ a b Schuit F, Moens K, Heimberg H, Pipeleers D (November 1999). "Cellular origin of hexokinase in pancreatic islets". The Journal of Biological Chemistry (published 1999). 274 (46): 32803–09. doi:10.1074/jbc.274.46.32803. PMID 10551841. ^ Schuit F, De Vos A, Farfari S, Moens K, Pipeleers D, Brun T, Prentki M (July 1997). "Metabolic fate of glucose in purified islet cells. Glucose-regulated anaplerosis in beta cells". The Journal of Biological Chemistry (published 1997). 272 (30): 18572–79. doi:10.1074/jbc.272.30.18572. PMID 9228023. ^ Santulli G, Pagano G, Sardu C, Xie W, Reiken S, D'Ascia SL, Cannone M, Marziliano N, Trimarco B, Guise TA, Lacampagne A, Marks AR (May 2015). "Calcium release channel RyR2 regulates insulin release and glucose homeostasis". The Journal of Clinical Investigation. 125 (5): 1968–78. doi:10.1172/JCI79273. PMC 4463204. PMID 25844899. ^ Stryer L (1995). Biochemistry (Fourth ed.). New York: W.H. Freeman and Company. pp. 343–44. ISBN 0 7167 2009 4. ^ Cawston EE, Miller LJ (March 2010). "Therapeutic potential for novel drugs targeting the type 1 cholecystokinin receptor". British Journal of Pharmacology. 159 (5): 1009–21. doi:10.1111/j.1476-5381.2009.00489.x. PMC 2839260. PMID 19922535. ^ Nakaki T, Nakadate T, Kato R (August 1980). "Alpha 2-adrenoceptors modulating insulin release from isolated pancreatic islets". Naunyn-Schmiedeberg's Archives of Pharmacology. 313 (2): 151–53. doi:10.1007/BF00498572. PMID 6252481. ^ Layden BT, Durai V, Lowe WL Jr (2010). "G-Protein-Coupled Receptors, Pancreatic Islets, and Diabetes". Nature Education. 3 (9): 13. ^ Sircar S (2007). Medical Physiology. Stuttgart: Thieme Publishing Group. pp. 537–38. ISBN 978-3-13-144061-7. ^ a b c d e Hellman B, Gylfe E, Grapengiesser E, Dansk H, Salehi A (2007). "[Insulin oscillations—clinically important rhythm. Antidiabetics should increase the pulsative component of the insulin release]". Läkartidningen (in Swedish). 104 (32–33): 2236–39. PMID 17822201. ^ Iwase H, Kobayashi M, Nakajima M, Takatori T (January 2001). "The ratio of insulin to C-peptide can be used to make a forensic diagnosis of exogenous insulin overdosage". Forensic Science International. 115 (1–2): 123–27. doi:10.1016/S0379-0738(00)00298-X. PMID 11056282. ^ a b "Handbook of Diabetes, 4th Edition, Excerpt #4: Normal Physiology of Insulin Secretion and Action". Diabetes In Control. A free weekly diabetes newsletter for Medical Professionals. 2014-07-28. Retrieved 2017-06-01. ^ McManus EJ, Sakamoto K, Armit LJ, Ronaldson L, Shpiro N, Marquez R, Alessi DR (April 2005). "Role that phosphorylation of GSK3 plays in insulin and Wnt signalling defined by knockin analysis". The EMBO Journal. 24 (8): 1571–83. doi:10.1038/sj.emboj.7600633. PMC 1142569. PMID 15791206. ^ Fang X, Yu SX, Lu Y, Bast RC, Woodgett JR, Mills GB (October 2000). "Phosphorylation and inactivation of glycogen synthase kinase 3 by protein kinase A". Proceedings of the National Academy of Sciences of the United States of America. 97 (22): 11960–75. Bibcode:2000PNAS...9711960F. doi:10.1073/pnas.220413597. PMC 17277. PMID 11035810. ^ a b Stryer L (1995). Biochemistry (Fourth ed.). New York: W.H. Freeman and Company. pp. 351–56, 494–95, 505, 605–06, 773–75. ISBN 0 7167 2009 4. ^ Menting JG, Whittaker J, Margetts MB, Whittaker LJ, Kong GK, Smith BJ, Watson CJ, Záková L, Kletvíková E, Jiráček J, Chan SJ, Steiner DF, Dodson GG, Brzozowski AM, Weiss MA, Ward CW, Lawrence MC (January 2013). "How insulin engages its primary binding site on the insulin receptor". Nature. 493 (7431): 241–45. Bibcode:2013Natur.493..241M. doi:10.1038/nature11781. PMC 3793637. PMID 23302862. Lay summary – Australian Broadcasting Commission. ^ a b c d e f g Dimitriadis G, Mitrou P, Lambadiari V, Maratou E, Raptis SA (August 2011). "Insulin effects in muscle and adipose tissue". Diabetes Research and Clinical Practice. 93 Suppl 1: S52–59. doi:10.1016/S0168-8227(11)70014-6. PMID 21864752. ^ "Physiologic Effects of Insulin". www.vivo.colostate.edu. Retrieved 2017-06-01. ^ Bergamini E, Cavallini G, Donati A, Gori Z (October 2007). "The role of autophagy in aging: its essential part in the anti-aging mechanism of caloric restriction". Annals of the New York Academy of Sciences. 1114 (1): 69–78. Bibcode:2007NYASA1114...69B. doi:10.1196/annals.1396.020. PMID 17934054. ^ Zheng, Chao; Liu, Zhenqi (June 2015). "Vascular function, insulin action, and exercise: an intricate interplay". Trends in Endocrinology & Metabolism. 26 (6): 297–304. doi:10.1016/j.tem.2015.02.002. PMC 4450131. PMID 25735473. ^ Kreitzman SN, Coxon AY, Szaz KF (July 1992). "Glycogen storage: illusions of easy weight loss, excessive weight regain, and distortions in estimates of body composition". The American Journal of Clinical Nutrition. 56 (1 Suppl): 292S–93S. doi:10.1093/ajcn/56.1.292S. PMID 1615908. ^ Benziane B, Chibalin AV (September 2008). "Frontiers: skeletal muscle sodium pump regulation: a translocation paradigm". American Journal of Physiology. Endocrinology and Metabolism. 295 (3): E553–58. doi:10.1152/ajpendo.90261.2008. PMID 18430962. ^ Clausen T (September 2008). "Regulatory role of translocation of Na+-K+ pumps in skeletal muscle: hypothesis or reality?". American Journal of Physiology. Endocrinology and Metabolism. 295 (3): E727–28, author reply 729. doi:10.1152/ajpendo.90494.2008. PMID 18775888. ^ Gupta AK, Clark RV, Kirchner KA (January 1992). "Effects of insulin on renal sodium excretion". Hypertension. 19 (1 Suppl): I78–82. doi:10.1161/01.HYP.19.1_Suppl.I78. PMID 1730458. ^ Benedict C, Hallschmid M, Hatke A, Schultes B, Fehm HL, Born J, Kern W (November 2004). "Intranasal insulin improves memory in humans". Psychoneuroendocrinology. 29 (10): 1326–34. doi:10.1016/j.psyneuen.2004.04.003. PMID 15288712. ^ Comninos AN, Jayasena CN, Dhillo WS (2014). "The relationship between gut and adipose hormones, and reproduction". Human Reproduction Update. 20 (2): 153–74. doi:10.1093/humupd/dmt033. PMID 24173881. ^ Duckworth WC, Bennett RG, Hamel FG (October 1998). "Insulin degradation: progress and potential". Endocrine Reviews. 19 (5): 608–24. doi:10.1210/er.19.5.608. PMID 9793760. ^ Palmer BF, Henrich WL. "Carbohydrate and insulin metabolism in chronic kidney disease". UpToDate, Inc.
^ D'Eon TM, Pierce KA, Roix JJ, Tyler A, Chen H, Teixeira SR (May 2008). "The role of adipocyte insulin resistance in the pathogenesis of obesity-related elevations in endocannabinoids". Diabetes. 57 (5): 1262–68. doi:10.2337/db07-1186. PMID 18276766. ^ Gatta-Cherifi B, Cota D (February 2016). "New insights on the role of the endocannabinoid system in the regulation of energy balance". International Journal of Obesity. 40 (2): 210–19. doi:10.1038/ijo.2015.179. PMID 26374449. ^ Di Marzo V (August 2008). "The endocannabinoid system in obesity and type 2 diabetes". Diabetologia. 51 (8): 1356–67. doi:10.1007/s00125-008-1048-2. PMID 18563385. ^ a b c d e f "Hypoglycemia". National Institute of Diabetes and Digestive and Kidney Diseases. October 2008. Archived from the original on 1 July 2015. Retrieved 28 June 2015. ^ Yanai, H; Adachi, H; Katsuyama, H; Moriyama, S; Hamasaki, H; Sako, A (15 February 2015). "Causative anti-diabetic drugs and the underlying clinical factors for hypoglycemia in patients with diabetes". World Journal of Diabetes. 6 (1): 30–6. doi:10.4239/wjd.v6.i1.30. PMC 4317315. PMID 25685276. ^ a b Schrier, Robert W. (2007). The internal medicine casebook real patients, real answers (3rd ed.). Philadelphia: Lippincott Williams & Wilkins. p. 119. ISBN 9780781765299. Archived from the original on 1 July 2015. ^ Perkin, Ronald M. (2008). Pediatric hospital medicine : textbook of inpatient management (2nd ed.). Philadelphia: Wolters Kluwer Health/Lippincott Williams & Wilkins. p. 105. ISBN 9780781770323. Archived from the original on 1 July 2015. ^ Marcial GG (13 August 2007). "From SemBiosys, A New Kind Of Insulin". Inside Wall Street. Archived from the original on 17 November 2007. ^ Wong CY, Martinez J, Dass CR (2016). "Oral delivery of insulin for treatment of diabetes: status quo, challenges and opportunities". The Journal of Pharmacy and Pharmacology. 68 (9): 1093–108. doi:10.1111/jphp.12607. PMID 27364922. ^ Shah RB, Patel M, Maahs DM, Shah VN (2016). "Insulin delivery methods: Past, present and future". International Journal of Pharmaceutical Investigation. 6 (1): 1–9. doi:10.4103/2230-973X.176456. PMC 4787057. PMID 27014614. ^ Sakula, A (July 1988). "Paul Langerhans (1847–1888): a centenary tribute". Journal of the Royal Society of Medicine. 81 (7): 414–15. doi:10.1177/014107688808100718. PMC 1291675. PMID 3045317. ^ Petit, Henri. "Edouard Laguesse (1861–1927)". Museum of the Regional Hospital of Lille (in French). Retrieved 25 July 2018. ^ Opie EL (1901). "Diabetes Mellitus Associated with Hyaline Degeneration of the islands of Langerhans of the Pancreas". Bulletin of the Johns Hopkins Hospital. 12 (125): 263–64. ^ Opie EL (1901). "On the Relation of Chronic Interstitial Pancreatitis to the Islands of Langerhans and to Diabetes Mellitus". Journal of Experimental Medicine. 5 (4): 397–428. doi:10.1084/jem.5.4.397. PMC 2118050. PMID 19866952. ^ Opie EL (1901). "The Relation of Diabetes Mellitus to Lesions of the Pancreas. Hyaline Degeneration of the Islands of Langerhans". Journal of Experimental Medicine. 5 (5): 527–40. doi:10.1084/jem.5.5.527. PMC 2118021. PMID 19866956. ^ Paulesco NC (August 31, 1921). "Recherche sur le rôle du pancréas dans l'assimilation nutritive". Archives Internationales de Physiologie. 17: 85–103. ^ Lestradet H (1997). "Le 75e anniversaire de la découverte de l'insuline". Diabetes & Metabolism. 23 (1): 112. ^ a b c Rosenfeld L (December 2002). "Insulin: discovery and controversy". Clinical Chemistry. 48 (12): 2270–88. PMID 12446492. ^ Wright JR (December 2002). "Almost famous: E. Clark Noble, the common thread in the discovery of insulin and vinblastine". CMAJ. 167 (12): 1391–96. PMC 137361. PMID 12473641. ^ Krishnamurthy K (2002). Pioneers in scientific discoveries. Mittal Publications. p. 266. ISBN 978-81-7099-844-0. Retrieved 26 July 2011. ^ Bliss M (July 1993). "Rewriting medical history: Charles Best and the Banting and Best myth". Journal of the History of Medicine and Allied Sciences. 48 (3): 253–74. doi:10.1093/jhmas/48.3.253. PMID 8409364. ^ Zuger A (October 4, 2010). "Rediscovering the First Miracle Drug". The New York Times. Retrieved 2010-10-06. Elizabeth Hughes was a cheerful, pretty little girl, five feet tall, with straight brown hair and a consuming interest in birds. On Dr. Allen’s diet her weight fell to 65 pounds, then 52 pounds, and then, after an episode of diarrhea that almost killed her in the spring of 1922, 45 pounds. By then she had survived three years, far longer than expected. And then her mother heard the news: Insulin had finally been isolated in Canada. ^ Marcotte B (November 22, 2010). "Rochester's John Williams a man of scientific talents". Democrat and Chronicle. Rochester, New York. Gannett Company. pp. 1B, 4B. Archived from the original on November 23, 2010. Retrieved November 22, 2010. ^ a b Stretton AO (October 2002). "The first sequence. Fred Sanger and insulin". Genetics. 162 (2): 527–32. PMC 1462286. PMID 12399368. ^ Costin GE (January 2004). "What is the advantage of having melanin in parts of the central nervous system (e.g. substantia nigra)?". IUBMB Life. Time Inc. 56 (1): 47–49. doi:10.1080/15216540310001659029. PMID 14992380. ^ Wollmer A, Dieken ML, Federwisch M, De Meyts P (2002). Insulin & related proteins structure to function and pharmacology. Boston: Kluwer Academic Publishers. ISBN 978-1-4020-0655-5. ^ Tsou, Chen-lu (2015). 对人工合成结晶牛胰岛素的回忆 [Memory on the research of synthesizing bovine insulin]. 生命科学[Chinese Bulletin of Life Science] (in Chinese). 27 (6): 777–79. ^ Kjeldsen T (September 2000). "Yeast secretory expression of insulin precursors". Applied Microbiology and Biotechnology. 54 (3): 277–86. doi:10.1007/s002530000402. PMID 11030562. ^ "The Nobel Prize in Physiology or Medicine 1923". The Nobel Foundation. ^ Castle WB (1962). "The Gordon Wilson Lecture. A Century of Curiosity About Pernicious Anemia". Transactions of the American Clinical and Climatological Association. 73: 54–80. PMC 2249021. PMID 21408623. ^ Banting FG, Best CH, Collip JB, Campbell WR, Fletcher AA (March 1922). "Pancreatic Extracts in the Treatment of Diabetes Mellitus". Canadian Medical Association Journal. 12 (3): 141–46. PMC 1524425. PMID 20314060. ^ Drury MI (July 1972). "The golden jubile of insulin". Journal of the Irish Medical Association. 65 (14): 355–63. PMID 4560502. ^ Murray I (April 1971). "Paulesco and the isolation of insulin". Journal of the History of Medicine and Allied Sciences. 26 (2): 150–57. doi:10.1093/jhmas/XXVI.2.150. PMID 4930788. Wikimedia Commons has media related to Insulin.